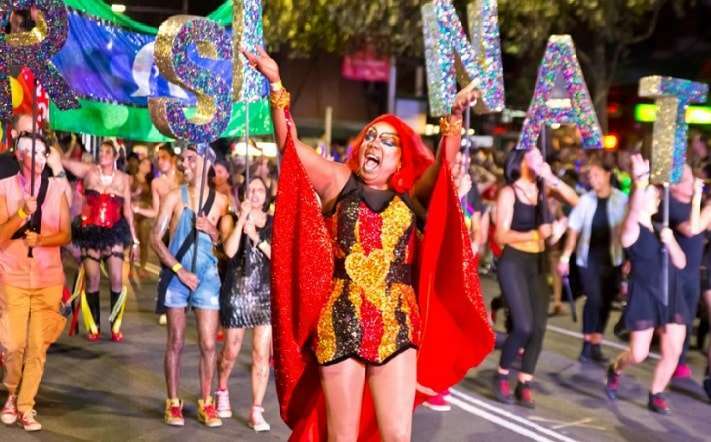 A contingent of First Nations people will again lead the 2019 Sydney Gay and Lesbian Mardi Gras parade this weekend, highlighting their proud Indigenous history and ongoing fight for equality. “The theme highlights the ground-breaking work our Aboriginal and Torres Strait Islander LGBTI peers did to pave the way for us today,” spokesperson Terrence Murphy said. Last year marked the 30th anniversary of Indigenous participation in Mardi Gras. It’s now tradition for the First Nations float to lead the parade, but the float’s 1988 debut was delegated a position later in the procession. The float, lead by Aboriginal South Sea Islander Malcolm Cole, was named “The Aboriginal Boat” and was a spoof re-enactment of the arrival of the First Fleet. The float served as a political statement about Australia’s 1988 bicentennial celebrations, which organisers say failed to acknowledge over 40 thousand years of Indigenous history. “It is enough trouble being black, let alone gay,” Cole told the Herald in 1988. To learn more about the participation of First Nations people’s entries in the Sydney Mardi Gras, an interactive timeline was created last year and can be viewed online here. The timeline contains photographs of Aboriginal and Torres Strait Islander people who have died. The 41st annual Sydney Mardi Gras festivities kicked off on Febuary 15, and will culminate in the annual parade and party on Saturday, March 2. A live stream of 2019 Mardi Gras parade will be available online on SBS On Demand and the SBS Twitter account on the Saturday. If you’re not travelling to Sydney for this year’s Mardi Gras parade, you’re invited to join in the celebrations at Brisbane’s Sportsman Hotel. Entry is free all night and a live stream of this year’s parade on the big screen from 6pm. The next day, the SBS telecast of the parade with commentary from Joel Creasey, Nerelda Jacobs, Zoe Coombs Marr and Patrick Abboud will screen on Sunday, March 3 from 8:35pm.